Overall, elbows are very important joints in your body. However, most people don’t seem to care much about that, even when it comes to weight training or contact sports. Trust me, I’ve already experienced elbow pain and it definitely wasn’t a good memory at all. Therefore, if you are taking part in a sport requiring repetitive arm motions, then look for the best elbow compression sleeves. But you don’t know where to start, do you? Well, that’s fine, just read and you will know what to do. Protect skin: Elbow compression sleeves can work as a protection to your skin while playing contact sports requiring repetitive arm motions such as football and basketball. Put it simply, just think of an elbow sleeve as a mini shield when you go up against other players on the football field. This way, they can protect you from cuts and bumps which can totally occur if you don’t wear them. Protect elbow joints: Have you ever seen a weight lifter wear these gears? Well, this is simply because they are designed to protect elbow joints, especially when you lift heavy weights. Increase blood circulation: When you have an injury, there might be bad blood circulation in your injured area. This will definitely have a bad impact on your performance since the bad circulation usually lead to inflammation and swelling. This is one of the main reasons why elbow compression sleeve are beneficial. Regulate body temperature: It is the fact that people using elbow sleeves are not affected by the temperature as much as others without ones. If you’re outside playing a sport, an elbow sleeve can also help regulate your body temperature. No matter whether it is cold or hot outside, it can still keep your body temperature regular effectively. Recover muscle quickly: This is very important not only in muscle building but also in any kind of sports that require repetitive arm motions. In details, elbow sleeves allow your blood flow to circulate to the heart more quickly so your injuries can heal much faster. Without them, the recovery could be a longer, thus, reducing your performance and efficiency. Improve performance and prevent muscle soreness: These gears are able to prevent soreness and tightness in your muscles. These sleeves help loosen up your sore muscles so that they won’t ache during your performance and when you’re healing. As mentioned above, elbow compression sleeves can not only prevent injuries during your performance but also help you recover quickly. That’s why you can wear them during your workouts and even at home when your muscles are recovering. In short, it’s okay to wear them all the time as long as you choose the right sleeves which are supportive and comfortable enough for you. For me, as a gym rat, I always wear elbow sleeves whenever I train my upper body, including chest, shoulder – those exercises using an adjustable bench, and back as well – those exercises using an adjustable bench. However, if you do weight training like me, don’t wear the sleeves in the beginning of the workout. Instead, allow your natural support system to adjust to the weight you are lifting first. With regard to elbow compression sleeves, it is almost all about mobility and this is especially important when you play a contact sport. That’s why you need to try some sleeves to see which one allows you to move comfortably the most. Remember that a sleeve which doesn’t give users any range of motion will probably cause them problems. Besides mobility, a sleeve should also be tight enough, depending on the type of sports you are playing. For example, if you do weight training or you are a powerlifter, then you will need to protect your elbows as much as possible. In this case, a loose one is nothing but a big waste of money. Instead, you’ll need to go for a sleeve with the most compression or one that is the most heavily reinforced stitched. These sleeves will last longer and hold their shape, thus, giving a max performance for a long time. In general, elbow sleeves are extremely tight, hence, you may have some issues with the fit if the sleeve is too small or too tight.In my experiences, it is best to pick something one size bigger than one you may normally get. On the other hand, if your priorities are compression and performance, then choose the smaller size. Just like that, if you find a sleeve distracting or restrictive for the sport you’re playing, go for the larger size. However, if you need the sleeve for faster recovery or elbow injury treatment, then just get any size that feels comfortable as much as possible. Therefore, you can wear it for extended periods of time. Actually, a small and restrictive sleeve without cutting off circulation is your best bet. Neoprene is the most common material when it comes to compressions sleeves. Therefore, when choosing an elbow compression sleeve, you may encounter blends of neoprene, elastic, and a bit of cotton. Besides, there are also nylons blends, Lycra blends, and copper-infused products. However, no matter what your sleeve is made from, you need to choose one which feels the best and helps you recover most effectively. What? Don’t you know how to tell if it feels best? Well, just try on or touch as many sleeves as you can to figure out what suits you best. Anyways, I don’t know about it but in my personal experience, neoprene is still the most durable material. It is the easiest to wash and more importantly, it can hold the shape and compression the best. My first impression of this sleeve is that it has a very good style, that’s why you can completely wear it anywhere you want. Furthermore, with the light, unisex elastic braces, it can keep you dry and comfortable even when you wear it all day and during sleep. 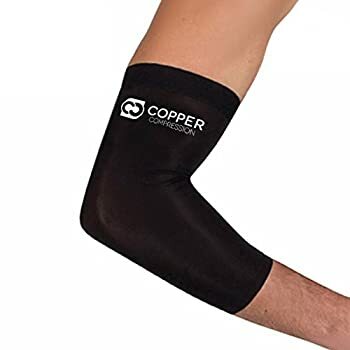 Besides, it has a high copper content and you can use it to recover faster and relieve your elbow pain or muscle stiffness. Another thing I like about this product is that it is long enough for everyone and for all kind of sports including weightlifting, running and so on. Additionally, the active Copper is extremely efficient in eliminating odors. However, this sleeve can be even more lightweight than you expect. In fact, there were reports of this product thinning out, even more, the materials can break down, causing a lack of elasticity. Also, the size runs quite large so if you are between sizes, just choose a smaller one for a nice fit. If you don’t need that much compression, this sleeve is a perfect choice for almost any type of sports. Overall, this Kunto elbow sleeve was made with 4 ways stretch fabric, that’s why it’s very breathable and supportive. In my opinion, it is very durable and it always maintains its tight form fit, more importantly, it will never compromise your mobility. It is stylish so you can wear it anytime, anywhere you want. In addition, this product has a more unique woven construction than many other sleeves. It also provides a solid amount of compression, which makes it suitable for all kinds of sports, even heavy weight training. Moreover, if you just want something to help with joint problems for everyday tasks, this one can also be a perfect choice. Besides, with the great contoured design, I’m pretty sure you want to try this one for complex movements. The downside of this product is that it is the inconsistent sizing. Actually, many people complained that although they went by the sizing chart, the sleeves they received didn’t fit right. Hence, it can be either a too loose or too tight fit. Anyways, if you want to look for an elbow sleeve for your workouts in the winter, then this is your best bet. 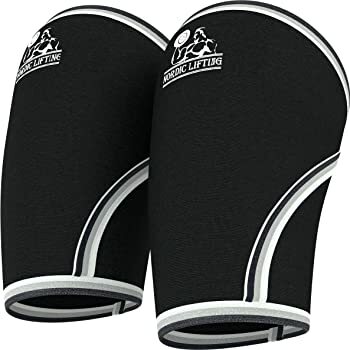 This one is made from bamboo charcoal fiber, thus, it is soft enough to feel comfortable and prevent irritation, but it’s still firm enough to provide you adequate support no matter which sport you play. Also, this sleeve can provide protection against Tennis and Golf elbow, carpal Tunnel syndrome, arm hyperextension pain, and so on. This is a perfect choice for as gym workouts, weight-lifting, basketball, and so on. For me, I really like to use this one whenever I bench heavy weights. This is because it can help develop a stronger grip as well as better control over the muscles. If you are looking for a product which helps boost your performance in sports requiring multiple and repetitive arm motions, go for this one. The fabric may be pulled out if you catch the sleeve on velcro. 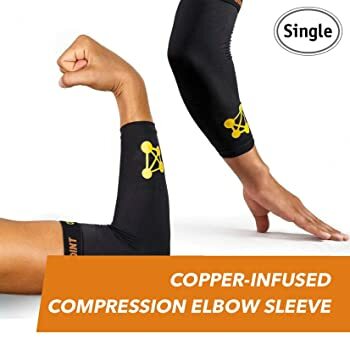 This is a copper -infused elbow sleeve which helps users contain odors and it is very popular for the antimicrobial properties. Actually, this is one of the products that have the highest copper content. You will find it can help relieve pain effectively and provide a fast recovery from injuries. When it comes to comfort and support, this is one of the best elbow compression sleeves. In fact, the material is quite thinner as compared to others but still gives you enough support to improve performance and elbow pain. Therefore, you can use this one for any kind of sports without it being bulky and getting in your way. One downside is that it is quite challenging to find one that fits you because of the improper sizing. The thin material can also likely to wear out quickly. For some people, it has an unpleasant odor. This pair of elbow sleeves is made from Premium quality nylon yarn. They can offer relief for different ailments such as general elbow pain, tendonitis, tennis elbow, and so on. This is one of the best choices for you to rehabilitate and it can prevent elbow injuries as well as increase your performance. Additionally, the compression also helps relieve your join pain and soreness, thus, leading to faster muscle recovery. This product comes with a one-year warranty so you don’t have to worry about them wearing out quickly. No matter whether you are men or women and no matter which type of sports you play, this one is still a good choice. 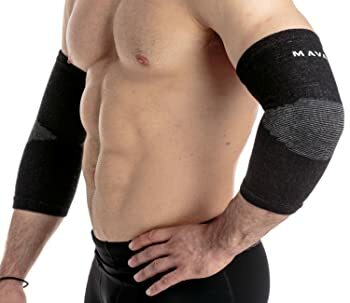 You can use these sleeves for weightlifting, crossing training and even tennis as well. After all, you should buy an elbow compression sleeve if you play any sport requiring arm motions, especially weightlifting. This can help you a lot more than it looks, especially for doing bench press. 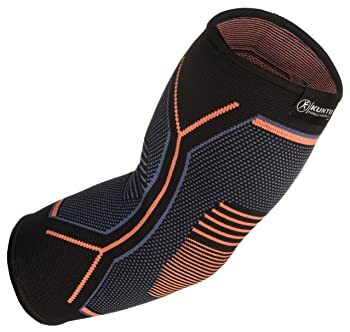 I hope that after reading this article, you will know what to do to choose the best elbow compression sleeves for yourself.